The World Watch and Jewellery Show, Bulova Corporation announced a revolutionary advance in timekeeping accuracy, introducing the Bulova Accutron Calibrator, featuring the world’s first and only External Fine Adjustment System (EFAS). Setting a new standard in individualized timekeeping, this unprecedented development lets watch enthusiasts control the accuracy of their mechanical watches, maintaining 99.99% accuracy simply and without need for a technician. With the introduction of the Bulova Accutron Calibrator with External Fine Adjustment System, watch enthusiasts, for the first time, have the ability to individualize the accuracy of a mechanical watch. Owners of fine mechanical timepieces know that maintaining peak performance can mean periodic visits to a jeweler for fine tuning. The Calibrator, however, permits wearers to achieve and maintain a personalized level of accuracy without the assistance of a professional. 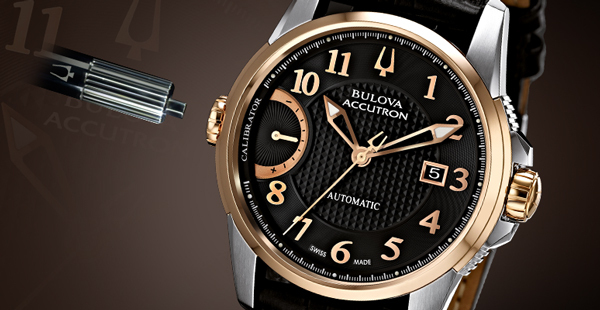 With the Swiss-made Bulova Accutron Calibrator, the exclusive and proprietary external fine adjustment system lets users fine tune their watches when needed, maintaining extraordinary accuracy based on their individual circumstances. The dial of the Calibrator includes a unique, easy-to-read adjustment gauge, located at the nine o’clock position, that allows owners to visually track each individual modification as they adjust for timing accuracy. The gauge is an arched track with a minus symbol at the top of the arch representing a slower speed, and a plus symbol at the bottom representing a faster speed. There are three notches going up and down, each representing an adjustment of five seconds per day. The fine tuning is facilitated by an external key that fits into a port on the side of the timepiece, letting the user adjust the length of the hairspring to optimize accuracy on an individual basis, with each adjustment visible on the regulator gauge. Providing 99.99% accuracy during intensive testing and validation by an independent laboratory in Switzerland, the Calibrator extends the Bulova Accutron brand’s reputation for technological innovation and extraordinary precision. With the company’s commitment to design, the Bulova Accutron Calibrator is simply and beautifully crafted, expressing the fine intricacy and easy operation of the technology. 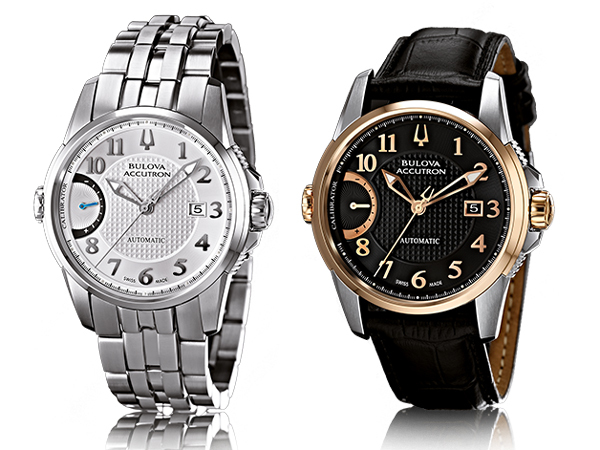 The Bulova Accutron Calibrator with External Fine Adjustment System will be available in three initial styles, slated to be available globally in September 2012.